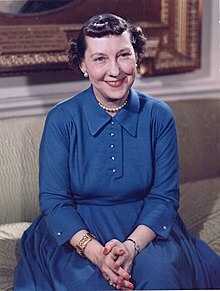 Mamie Geneva Eisenhower (née Doud; November 14, 1896 – November 1, 1979) was wife of United States President Dwight D. Eisenhower and thereby First Lady of the United States from 1953 to 1961. 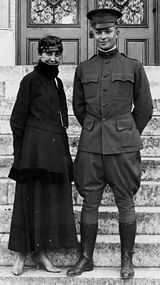 Mamie married Dwight Eisenhower at age 19 in 1916. The young couple moved frequently between military quarters in many postings, from Panama to the Philippines. As First Lady, she entertained a wide range of foreign dignitaries, who reacted well to her confident style and clothing choices. Mamie Eisenhower spent her retirement and widowhood at the family farm in Gettysburg, Pennsylvania. Born in Boone, Iowa, and named, in part, after the popular song Lovely Lake Geneva, Mamie Geneva Doud was the second child born to John Sheldon Doud (1870–1951), a meatpacking executive, and his wife, Elivera Mathilda Carlson (1878–1960). She grew up in Cedar Rapids, Iowa, Colorado Springs, Colorado, Denver, Colorado, and the Doud winter home in San Antonio, Texas. Her father, who retired at age 36, ran a meatpacking company founded by his father, Doud & Montgomery ("Buyers of Live Hogs"), and had investments in Illinois and Iowa stockyards. Her mother was a daughter of Swedish immigrants. She had three sisters: Eleanor Carlson Doud, Eda Mae Doud, and Mabel Frances "Mike" Doud. Soon after completing her education at Wolcott School for Girls, a finishing school, she met Dwight Eisenhower in San Antonio in October 1915. Introduced by Mrs. Lulu Harris, wife of a fellow officer at Fort Sam Houston, the two hit it off at once, as Eisenhower, officer of the day, invited Miss Doud to accompany him on his rounds. On St. Valentine's Day in 1916, he gave her a miniature of his West Point class ring to seal a formal engagement. Lieutenant Dwight D. Eisenhower, aged 25, married Mamie Doud, aged 19, on July 1, 1916, at the home of the bride's parents in Denver, Colorado. Following the wedding, performed by Reverend Williamson of the Central Presbyterian Church in Denver, the newlyweds honeymooned a few days at Eldorado Springs, Colorado, a resort near Denver, and then visited the groom's parents in Abilene before settling into the lieutenant's living quarters at Fort Sam Houston. Doud Dwight "Icky" (September 24, 1917 – January 2, 1921) died of scarlet fever. John Sheldon Doud (August 3, 1922 – December 21, 2013) – soldier, diplomat, author – was born in Denver, Colorado; he graduated from West Point in 1944 and earned a master's degree in English literature from Columbia University in 1950. After retiring from a military career (1944–1963), he was appointed ambassador to Belgium (1969–1971) by Richard Nixon. He authored ten books, among them an account of the Battle of the Bulge: The Bitter Woods (1969); Strictly Personal (1974); and Allies: Pearl Harbor to D-Day (1982). 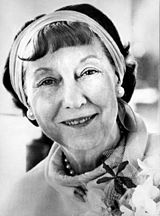 For years, Mamie Eisenhower's life followed the pattern of other Army wives: a succession of posts in the United States, in the Panama Canal Zone; duty in France, and in the Philippine Islands. Although accustomed to more creature comforts than those afforded at military posts, Mamie adjusted readily and joined her husband in moving 28 times before their retirement at the end of his term as president. During the Second World War, while promotion and fame came to "Ike", his wife lived in Washington, D.C. After he became president of Columbia University in 1948, the Eisenhowers purchased a farm (now the Eisenhower National Historic Site) at Gettysburg, Pennsylvania. It was the first home they had ever owned. His duties as commander of North Atlantic Treaty Organization forces—and hers as his hostess at a villa near Paris—delayed work on their dream home, finally completed in 1955. They celebrated with a housewarming picnic for the staff at what would be their last temporary quarters: the White House. Diplomacy—and air travel—in the postwar world brought changes in their official hospitality. The Eisenhowers entertained an unprecedented number of heads of state and leaders of foreign governments. As First Lady, she was noted for her outgoing manner, her love of pretty clothes, some of them designed by Scaasi, jewelry, and her obvious pride in husband and home. Eisenhower was named one of the twelve best-dressed women in the country by the New York Dress Institute every year that she was First Lady. The "Mamie Look" involved a full-skirted dress, charm bracelets, pearls, little hats, and bobbed, banged hair. It was a modified version of the Dior's postwar "New Look." Her style included both high-and low-end items. Designers strongly associated with Eisenhower include Mollie Parnis, Trifari, and Sally Victor. Eisenhower wore a Nettie Rosenstein gown to the 1953 inaugural balls. It was pink peau de soie gown embroidered with more than 2,000 rhinestones. It is one of the most popular in the Smithsonian National Museum of American History's collection of inaugural gowns. Eisenhower paired the gown with matching gloves, and jewelry by Trifari. She carried a beaded purse by Judith Leiber (then an employee of Nettie Rosenstein). Her shoes by Delman had her name printed on the left instep. Eisenhower's fondness for a specific shade of pink, often called "First Lady" or "Mamie" pink, kicked off a national trend for pink clothing, housewares, and bathrooms. As First Lady, she was a gracious hostess but carefully guarded her privacy. A victim of Ménière's disease, an inner-ear disorder that affects equilibrium, Eisenhower was uneasy on her feet, which fed rumors that she had a drinking problem. Eisenhower was known as a penny pincher who clipped coupons for the White House staff. Her recipe for "Mamie's million dollar fudge" was reproduced by housewives all over the country after it was printed in many publications. In 1958, Mrs. Eisenhower was also reported to be the first person to initiate Halloween decorations to be put up in the White House. As described in multiple biographies, including Upstairs at the White House by J. B. West, Eisenhower was reportedly unhappy[why?] with the idea of John F. Kennedy coming into office following her husband's term. Despite new First Lady Jacqueline Kennedy having given birth to her son John Jr. via caesarean section two weeks prior, Eisenhower did not inform Kennedy that there was a wheelchair available for her to use while showing her the various sections of the White House. Seeing Eisenhower's displeasure during the tour, Kennedy kept her composure while in Eisenhower's presence, finally collapsing in private once the new First Lady returned home. When Mamie Eisenhower was later questioned as to why she would do such a thing, the former First Lady simply stated, "Because she never asked." In 1961, Eisenhower retired with the former president to Gettysburg, their first permanent home. They also had a retirement home in Palm Desert, California. After her husband's death in 1969, she continued to live full-time on the farm until she took an apartment in Washington, D.C., in the late 1970s. She appeared in a campaign commercial for her husband's former Vice President Richard Nixon in 1972. David Eisenhower, her grandson, married Richard Nixon's daughter Julie on December 22, 1968, bringing the two families closer together. The Nixons regularly invited Mamie to the White House, for example, including her in their Christmas dinner. Eisenhower suffered a stroke on September 25, 1979. She was rushed to Walter Reed Army Medical Center, where her husband had died a decade before. Eisenhower remained in the hospital, and on October 31, announced to her granddaughter Mary Jean that she would die the next day. She died in her sleep very early the morning of November 1. In 1980, her birthplace in Boone, Iowa, was dedicated as a historic site; Abigail Adams is the only other First Lady to be so honored. One of the east-west streets in Boone (Fourth Street) is now called Mamie Eisenhower Avenue. Because of her connection with the city of Denver and the area surrounding, a park in southeast Denver was given Mamie's name, as well as a public library in Broomfield, Colorado, a suburb of Denver. ^ a b Tatanka Historical Associates (February 25, 2005). "National Register of Historic Places Registration Form" (PDF). www.coloradohistory-oahp.org. Colorado Historical Society Office of Archeology & Historic Preservation. Archived from the original (PDF) on August 16, 2006. Retrieved February 4, 2009. ^ "Mamie Eisenhower Biography". National First Ladies Library. Retrieved December 27, 2013. ^ James Bretz (2010). Denver's Early Architecture. Arcadia Publishing. p. 114. ISBN 978-0-7385-8046-3. ^ Bissonnette, Anne (June 29, 2001). "Scaasi An American Icon". Curator for The Kent State University Museum. Archived from the original on June 15, 2006. Retrieved June 29, 2006. ^ a b Sibley, Katherine A. S. (March 14, 2016). A Companion to First Ladies. John Wiley & Sons. ISBN 9781118732182. ^ a b c Pous, Terri. "Our Fair Ladies: The 14 Most Fashionable First Ladies". Time. ISSN 0040-781X. Retrieved July 5, 2016. ^ a b "Mamie Eisenhower". National Museum of American History. Retrieved July 5, 2016. ^ "Mamie Eisenhower". National Museum of American History, Smithsonian Institution. Retrieved August 26, 2008. ^ Jennifer Wright (March 20, 2015). "How Pink Became a Color for Girls". Racked. ^ Peril, Lynn (October 17, 2002). Pink Think: Becoming a Woman in Many Uneasy Lessons. W. W. Norton & Company. ISBN 9780393349931. ^ Gould, Louis L. (2001). American First Ladies: Their Lives and Their Legacy. Taylor & Francis. p. 315. ISBN 978-0-415-93021-5. ^ Kantrowitz, Barbara (June 13, 2007). "State of their unions: Candidates' marriages". msnbc.msn.com. Microsoft. Retrieved January 9, 2009. ^ Staff, Country Living (September 29, 2016). "What Halloween Was Like the Year You Were Born". countryliving.com. Country Living. Retrieved October 12, 2016. ^ West, J. B. (1973). Upstairs at the White House: My Life with the First Ladies. Coward, McCann & Geoghegan. p. 192. ISBN 0-698-10546-X. ^ Haymann, C. David (1989). A Woman Named Jackie: An Intimate Biography of Jacqueline Bouvier Kennedy Onassis. Carol Communications. p. 251. ISBN 0-8184-0472-8. ^ Historical Society of Palm Desert; Rover, Hal; Kousken, Kim; Romer, Brett (2009). Palm Desert. Charleston, SC: Arcadia Publishing. p. 103. ISBN 978-0-7385-5964-3. ^ "Mamie Doud Eisenhower chronology". Dwight D. Eisenhower Presidential Library and Museum. Retrieved December 27, 2013. ^ "The Living Room Candidate – Commercials – 1972 – Mamie". ^ "Biography: Mamie Doud Eisenhower". dwightdeisenhower.com. Dwight D. Eisenhower Foundation. Archived from the original on December 26, 2008. Retrieved January 9, 2009. This page is based on the Wikipedia article Mamie Eisenhower; it is used under the Creative Commons Attribution-ShareAlike 3.0 Unported License (CC-BY-SA). You may redistribute it, verbatim or modified, providing that you comply with the terms of the CC-BY-SA.